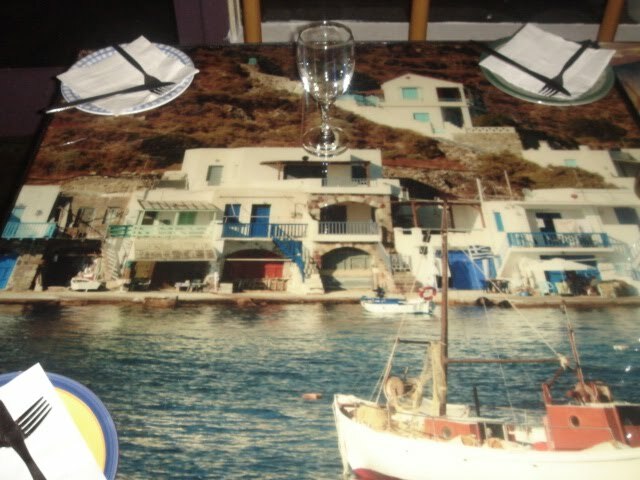 Back Chat: Marika's For Amazing Greek Food. Marika's at 38 Victoria Road, Bakoven, is one of those very rare gems, a neighbourhood, family run restaurant serving amazing food to an adoring public. 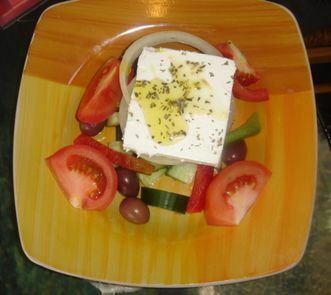 And best of all, the amazing food is Greek food. Yes, can you believe it and right under our very noses! As a family we love Greek food, having learnt all about it at the table of the late great Greek Master Chef, Strati Constanides. I mention him as a tribute and also as an indication of the level of our expectations when we eat Greek food. So imagine our joy when we tasted Marika's food and realised that we had come home. Here were the long- remembered and long sought - after flavours, textures and aromas. Life really does dish up wonderful surprises. 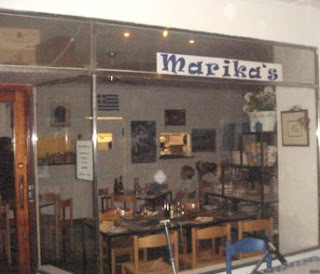 Marika's Restaurant opened on the 10th December 2005. Marika Pettenuzzo and Frank Resnik are the helmsman of this lovely place. Marika is the culinary force and her son Alessandro, a superb chef, alternates with his mother in the kitchen, producing food of the same remarkable standard. Frank is a genial welcoming host ably assisted in this job by Fabiano, Marika's younger son. Fabiano also waits tables and is an informed, friendly and good looking addition to the whole scene. I told you it was a family affair . The menu has a list of mezedes (starters) that make one want to order everything. All the favourites are there: dolmades, either in vine leaves or cabbage; keftedes, spanakopita, tsaziki, skordalia, taramasalata, marithes, crisp fried white bait when available; fried Haloumi cheese and so much more. All home made and all delicious. 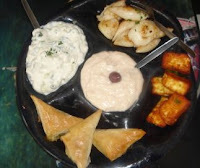 To save one's sanity and to stop endless dithering, there is a meze platter option where you can order any five items. Frankly, that is difficult enough and Eugene and I had a hard time choosing only five dishes. Eventually, after much discussion, we settled on keftedes, dolmades, skordalia, tsatziki and taramasalata and two pitas to add to the enjoyment of it all. When the meze platter arrived, we realised that our eyes were a great deal bigger than our stomachs. But no matter, we had all night to eat and enjoy this feast. That is the philosophy at Marika's. The table is yours for the night so that you can enjoy the food, the wine and the vibe with nothing to interfere with the serious business of eating. And oh the food! The keftedes, lovely, spicy meatballs, were absolutely delicious; succulent dolmades which we prefer wrapped in cabbage; skordalia that teased the taste buds with just the right amount of garlic, and taramasalata and tsatziki with flavours that delighted us both. All this mopped up with pita until there was not a vestige of food left. The main courses require lots of return visits in order to try them all. We were so tempted by the lamb, chicken or prawn kebabs. We found it hard to resist the moussaka and incidentally there is also a vegetarian moussaka topped with a soufflèd white sauce. To further tempt one there is sheftalia, grilled sausage wrapped in panna, line-fish in several incarnations and on and on. All the main courses are served with potato wedges or kritharaki (pasta rice) or Greek Peasant Salad. But we ordered our absolute favourite, Greek lamb. Eugene chose Arni Sto Fourno, slow-baked lamb in lemon and herbs accompanied by potato wedges and I opted for lamb chops, a new addition to the menu, also in lemon and herbs with a Greek salad on the side. The food was splendid. The slow-baked lamb was a triumph. The meat, succulent and almost falling of the bone. My chops were tasty and juicy. The potato wedges were plentiful and crispy and my salad, fresh and delicious. A new addition to the main courses is the burgers. This is a Greek version and judging by the number that I saw coming out of the kitchen, obviously something to try. Served on pita bread, with chopped beef, tsatziki and topped with onion and tomato, it is a lovely light meal. To further complicate matters there are a whole bunch of Marika's side orders and one can choose just about extra everything. We couldn't eat another thing, but I do recommend the desserts. The nougatine cake is blissful. This has to be ordered in advance and eaten fresh. You maybe lucky and order it on a day when someone else has requested it. Nothing is kept frozen or left standing at Marika's. 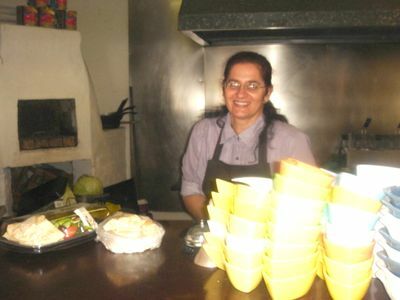 Try lovely home made Halva ice cream or Baklava or Greek Lemon Yoghurt and more. 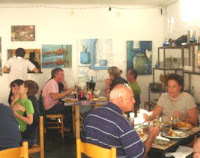 We returned to Marika's on Sunday for lunch, the only day that it is open for lunch. This time my daughter, Lexie, was with us and was as bowled over as we had been when first we came. We each ordered a meze platter, which was to be our whole meal. Fabiano, very gently and tactfully tried to tell us that we had ordered a huge amount of food. With dogged determination we persisted in our choice. Of course it was totally delicious, but we all left with doggy bags. The meze portions are very generous. The doggy bags are beautifully presented containers that look very appetising and not at all like leftovers. Marika's also caters for functions. 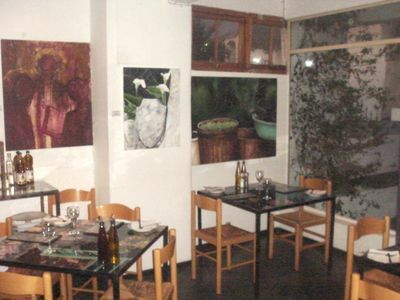 The restaurant can be reserved in its entirety as long as there are 30 or more guests. I think it would be tremendous fun to have a birthday party there. They also do outside functions and you could have a 'Marika' party at home. Also, they do takeaways. So if you are dying to taste something special and can't get out for the evening, then order something delicious to take home. Alessandro confided that they are negotiating for premises as they hope to open a second restaurant. Alessandro would man one and Marika the other. Now wouldn't that be wonderful? Watch this spot for updates. Marika's is very child friendly. The kiddies love the potato wedges and the kebabs. Marika's can also be pet friendly as long as you and your pooch enjoy your meal in the covered outside area, Of course, this is weather permitting and I saw a number of people enjoying their meal alfresco. Marika's has relocated to: 176 Upr Buitenkant Street, Gardens. Cape Town.